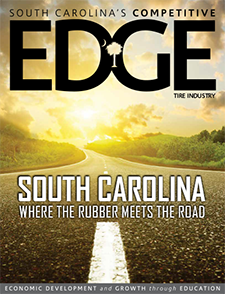 In November 2014, Michelin North America made history when the company debuted plans for the world’s first manufacturing plant to build revolutionary airless radial tires in Piedmont, SC. The new 135,000 square-foot facility signifies a $50 million investment and represents Michelin’s 10th manufacturing facility in South Carolina and the 16th in the US. readySC™ is working with Michelin to recruit for the new facility in Piedmont and their other expansions in the state. This cements Michelin’s presence in South Carolina, the home of Michelin North America’s corporate headquarters. According to a Michelin press release, the new facility will produce the MICHELIN® X® TWEEL® Airless Radial Tire™. This non-pneumatic tire brings together the tire and the wheel assembly into one solid unit. In layman’s terms, that means it doesn’t use air, so it won’t go flat. The birthplace of this revolutionary design is South Carolina, so it only makes sense that it be manufactured here as well. This innovative approach has been a hallmark of Michelin in South Carolina since it first came to the state four decades ago. readySC has worked with the company from the beginning, tailoring training programs specific to the organization’s needs. As skill requirements evolved, readySC quickly adjusted to meet those changing needs. This level of commitment led to a long-standing partnership that has supported decades of expansions and start-ups, demanding ever-increasing skills from the workforce. Through the SC Technical College System, South Carolina provides a comprehensive workforce solution to organizations in the Palmetto State. As part of the System’s Division of Economic Development, readySC excels at attracting new and expanding industry to the state. And, Apprenticeship Carolina™ works to deliver the workforce development tools necessary to ensure that organizations grow and prosper in South Carolina over the long-term. Michelin provides an excellent example of this long-term investment in our state’s business and industry. In 2013, Michelin announced a structured two-year apprenticeship program for all of its maintenance technicians in South Carolina. Apprenticeship Carolina guided Michelin through the registered apprenticeship process from initial information to full recognition in the National Registered Apprenticeship System. The program was custom designed to work in conjunction with the Michelin Scholars program. Completion of the apprenticeship program will lead to a full associate’s degree for each apprentice. Michelin partnered with technical colleges across the state to deliver approximately 1,110 hours of job-related education consisting of a blend of classroom learning and hands-on job experience for all maintenance staff. Apprenticeship Carolina worked closely with Michelin to help their workforce continue to grow by establishing registered apprenticeships designed to enhance the skills of existing employees. By working together, readySC and Apprenticeship Carolina provide a comprehensive training solution for companies like Michelin that are looking for long-term success in the state. Michelin North America is a prime example of long-lasting success in South Carolina, where the tire maker operates eight tire plants, two rubber mixing/calendering plants, its corporate headquarters, a research-and-development facility and a test track, all employing more than 8,900 in the state.